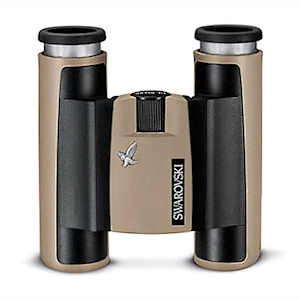 The Swarovski CL Pocket 10x25 sand (Traveler) binocular is made with a double-hinge design that permits them to fold up so compactly that they fit easily in your palm or shirt pocket. 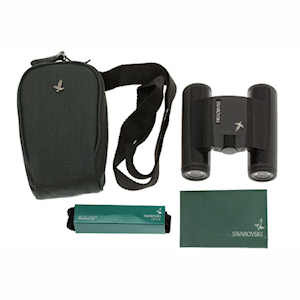 Swarovski 10x25 CL Pocket binoculars have a generous 17 mm of eye relief, which is more than some full-sized binoculars provide and much more than most compact binoculars. 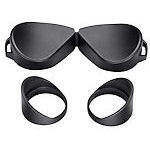 These CL Pocket binoculars can close focus down to 8.2 feet, which is excellent for a compact roof prism design. 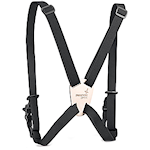 Swarovski CL Pockets are waterproof, dust-proof and fog-proof. Field of View: 294 ft. at 1000 yds. Dimensions: 4.3 x 3.9 x 1.8 in. Product Weight (oz): 12.3 oz.